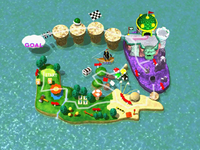 Mini-Game Island is an island located on the outskirts of the Mushroom Village in Mario Party. To get here, the player must use the raft in the Mushroom Village. The goal of the island is to clear all 50 minigames, although the character can reach the end by taking shortcuts. The player starts out with four lives and loses a life every time they fail a minigame. Coins are won after each minigame is complete. Collecting 100 coins grants the character a life. At World 9, Fwoosh can take the character to start if they want to. Mini-Game Space – enter this space to play a minigame. Blue spaces are uncleared spaces and the yellow spaces are cleared spaces. Koopa Troopa Space – enter this space to talk to the Koopa Troopa and save. Most worlds end with a Koopa Troopa Space. Entrance Space – enter this space to go to another area. Pink Space – this space cannot be entered and are merely used to move across. After clearing all of the minigames in World 9 and beating Toad at the Goal, the character will receive Bumper Ball Maze 1 from Koopa Troopa, and if all the minigames are cleared, Toad will give Bumper Ball Maze 2 to the player as well. Finally, if the player beats the current record on both of those mazes, they will unlock Bumper Ball Maze 3. There are many different paths the player can take to get through Mini-Game Island to the end, as follows. 1st World 2nd World 3rd World 4th World 5th World 6th World 7th World 8th World 9th World Does Bumper Ball Maze 2 unlock? The exterior map's music adds accompaniment when Worlds 1 and 2 are each completed. The World 4 Cave and the World 6-8 Castle have their own songs, but World 8 (third floor) has extra accompaniment which does not add to Worlds 6-7 (first and second floors respectively). After accessing World 9 after completing World 8, the exterior map's music changes drastically. This page was last edited on October 15, 2018, at 15:44.